The World Health Organization considers viral hepatitis as an international public health challenge comparable to other major communicable diseases. While these are becoming less lethal, the number of hepatitis B virus (HBV) related deaths is increasing steadily, necessitating a coordinated global approach to curing HBV. Worldwide, 257 million people (3.5% of the population) are chronically infected with hepatitis B virus (HBV) and, even though a prophylactic vaccine and effective antiviral therapies have been developed, there is no cure. While vaccination efforts are substantially slowing down incidence in most countries, HBV infections are still rising. HBV kills more people than malaria, with chronic HBV (CHB) infection resulting in more than 880,000 deaths per year from cirrhosis and liver cancer. No cure for CHB exists due in part to the continued presence of a viral reservoir which is not targeted by current therapies. CHB persists despite the best treatment, and risks of liver cancer remain. Current treatments for CHB must generally be taken for life to remain effective and only 8 per cent of people who need treatment have access to them. Despite the huge human and economic toll of chronic HBV infection, HBV research has been largely underfunded compared to other diseases. Enhanced investments could make a big difference, create important resources savings from treatment scale-up, and ensure that improved treatments prevent adverse outcomes in all patients. Recent technological advances have led to the development of a cell culture model of persistent HBV infection. This makes it possible, for the first time since the discovery of HBV, to study the mechanisms that control the biogenesis, homeostasis and decay of its covalently closed circular DNA (cccDNA) transcriptional template, and to exploit that information to eradicate HBV from infected cells. Targeting this viral reservoir will be the key to curing CHB. We believe that given recent scientific progress in HBV research and the momentum created by hepatitis C cure discoveries, governments, foundations and other research sponsors should work together to accelerate HBV cure research now. In 2016, a group of prominent scientists published a “call to arms” manuscript suggesting a coordinated global approach to HBV cure was urgently required. This generated substantial interest which led to the formation of the International Coalition to Eliminate Hepatitis B (ICE-HBV) in September 2016, ratified at the International HBV Meeting in Seoul. 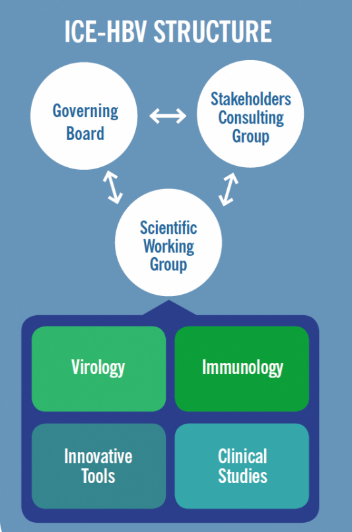 Organisational structure of ICE-HBV and the international scientific working groups. 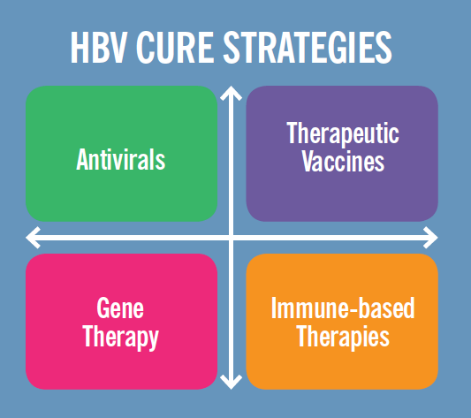 biomarkers of HBV immunopathogenesis, disease progression, treatment response and markers predictive of a durable cure. Areas targeted for HBV cure research. 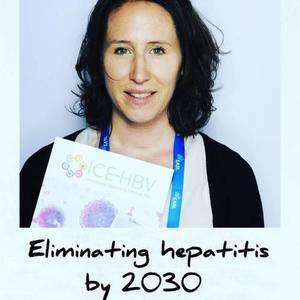 Capucine Penicaud is Programme Manager for the International Coalition to Eliminate HBV (ICE-HBV). She leads the secretariat of the Coalition based at the Doherty Institute for Infection and Immunity in Melbourne, Australia. Her portfolio also includes managing the Doherty Institute’s research Themes and Cross-cutting Disciplines’ programme. She has over ten years of experience in international development and global health, both in non-profit (International AIDS Society) and government organisations (French Foreign Affairs Ministry). Her work focuses on the design of international strategic research initiatives such as the IAS’ Towards an HIV Cure programme and ICE-HBV.